DermaSweep™ is a state-of-the-art, painless, particle-free microdermabrasion system that reduces early signs of aging, hyperpigmentation, photo damage and acne, and improves overall skin health. The DermaSweep™ micro-resurfacing system combines exfoliation with the delivery of topical solutions customized for each patient’s skincare needs. 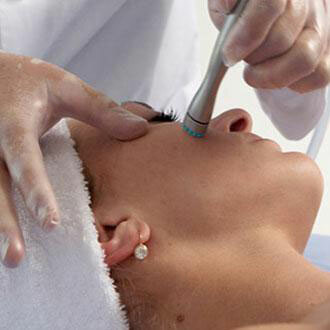 We recommend monthly treatments to achieve and maintain the best results. Depending on your skin’s condition, DermaSweep™ can be combined with chemical peels, Dermaplaning, DermaSweep™ (microdermabrasion), ClearLift™ Lunch Time Face Lift, or the IPL Photo Facial for even better results. DermaSweep™ multi-level micro-resurfacing system uses bristles along with vacuum for effective exfoliation and blood flow stimulation. After the desired level of exfoliation, the skin is infused with paraben-free topical skin solutions or PeelFusions for total skin rejuvenation.